* Aduana Stars FC has signed Sadiq Haji Abubakar, formerly of Berekum Arsenal FC and Ebusua Dwarfs. Abubakar is a central midfielder with a powerful shot and a healthy work-rate. So far, Abubakar has primarily made substitute appearances for his new club. * Another new signing at Aduana Stars FC is striker Theophilus Mensah, formerly of Hearts of Oak SC and Nania FC. * A week ago, right-back Godfred Saka (born 02.11.1988), left-winger Daniel Darkwah and attacking midfielder Alex Aryee were all named in the squad of the Ghana B national football team. These are key players at Aduana Stars FC, especially Saka and Darkwah. * Eric Ofori Antwi of Amidaus Professionals FC is a promising goalkeeper. Antwi, most likely born in 1993, is a product of the well-known Red Bull Academy, based in Sogakope. * Left-back Owusu Sefa (born 27.08.1987), on loan from Hearts of Oak SC to Amidaus Professionals FC, will become important for the survival hopes of the newly promoted team. Sefa tackles hard and loves to join the attack. * Central midfielder Mohammed Yahaya (born 17.12.1988), on loan from Asante Kotoko FC to Amidaus Professionals FC, has been sensational so far this season, having scored four goals in four matches. Yahaya is currently captaining the team. * According to www.asantekotokosc.com, centre-back Kwabena Adusei of Asante Kotoko FC is born 03.06.1987. I have previously written that Adusei is born 03.06.1986, based on information found on former homepage of Kessben FC, but I will write 03.06.1987 in the continuance. A week ago, Adusei was named in the squad of the Ghana B national football team, alongside playmaker Michael Helegbe (born 15.09.1985), winger Richard Mpong (born 04.07.1990) and top striker Kofi Nti Boakye (born 05.04.1987). I think all players deserves their chance, but Mpong has been far from impressive during his first five three matches for Asante Kotoko FC. * Left-back Joseph Ochaya from Uganda is already a fan’s favourite at Asante Kotoko FC. The energetic Ochaya scored his first goal in the red shirt against Berekum Arsenal FC on 28.10.2012, apparently a thunderbolt shot. 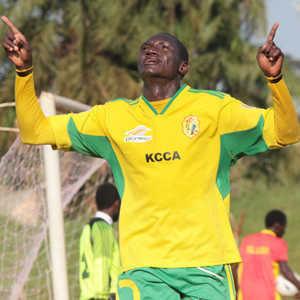 The picture is of Ochaya and was found on MTN Football. * Star striker Yakubu Mohammed (born 26.07.1990) of AshantiGold SC has been highly impressive so far this season, having scored five goals during the first six matches. Two of the goals have been the result of Mohammed beating an offside-trap. Mohammed, a burly striker, loves to make runs behind the opposite defenders, using his tremendous pace. I believe Mohammed is soon ready for bigger leagues. A week ago, Mohammed was named in the squad of the Ghana B national football team, alongside goalkeeper Fatau Dauda (born 06.04.1985), central defender Lawrence Lartey and left-winger Latif Mohammed. * AshantiGold SC has signed Shafiu Mumuni, a striker who was rather impressive at relegated Wassaman United FC last season, scoring four goals. * I believe right-winger Peter Essien will be the key player for struggling Berekum Arsenal FC this season. Essien was a shining light for relegated Bechem United FC last season. * Last week, midfielder Abu Issah of Berekum Arsenal FC was named in the squad of the Ghana B national football team. From my point of view, this is a big surprise. * Speedy striker Latif Salifu (born 01.08.1990) has been a sensation for Berekum Chelsea FC, having scored four goals during the first six matches of the season. Two of the goals have been real beauties; the first a dribbling solo raid against Heart of Lions FC, the second a wonderful strike from the corner line against Hearts of Oak SC. The petit Salifu, who loves to attack from the flanks, joined Berekum Chelsea FC from Liberty Professionals FC before the season. * Last week, the following players of Berekum Chelsea FC were named in the squad of the Ghana B national football team: central defender Ahmed Adams (born 10.10.1992), the versatile Jackson Owusu (born 15.10.1988) and playmaker Solomon Asante (born 06.03.1987). * Christopher Bonney, primarily a right-back or right-winger, has been a revelation at Ebusua Dwarfs, winning a place in the squad of the Ghana B national football team after just five top level matches. When Bonney attacks from the right or Francis Morton, the new signing from Liberty Professionals FC, attacks from the left, Dwarfs always looks dangerous. The excellent left foot of Morton will cause a lot of trouble for opposite defenders during the season. A few hours ago, Morton scored his first goal for his new club. * Foli Adade, the talented goalkeeper of Ebusua Dwarfs, was also included in the squad of the Ghana B national football team. Despite having tough competition from the more experienced Patrick Antwi, signed from Liberty Professionals FC, Adade has kept his place as the number one goalkeeper at Dwarfs. * Talented striker Benjamin Fadi (born 16.03.1995) of Heart of Lions FC scored his first goal of the season, a header after a cross from captain Daniel Acquaye, in the Week 5 match against Amidaus Professionals FC. * Hearts of Oak SC has made a poor start to the season. However; there are a couple of bright spots. Centre-back Nuru Sulley, signed from Mighty Jets FC, has been impressive at times. Sulley has already scored two goals; both after winning duels in the box. * I have read some interesting articles about Winful Cobbina, a young, exciting prospect at Hearts of Oak SC. Midfielder Cobbina, signed from amateur club R-Stake FC, has been described as tall, athletic and skillful player with a cultured left-foot. Cobbina made his top level debut for Hearts of Oak SC on 28.10.2012 against Berekum Chelsea FC. * Last week, midfield workhorse Abubakar Moro (born in 1991) and top striker Mahatma Otoo (born 06.02.1992) were both included in the squad of the Ghana B national football team. Otoo has scored four goals in six matches so far this season. * Sulley Mohammed is a highly regarded striker at King Faisal Babes. Mohammed, who had a breakthrough season when King Faisal won promotion in 2011-2012, has already scored two goals in his first ever season at top level. * Who would have thought that Kennedy Ashia of Liberty Professionals FC would be top scorer in the GLO Premier League 2012-2013 after Week 6? Teenager Ashia has scored five goals so far this season, playing just behind the striker(s) in an attacking midfield role – the same role Michael Helegbe had for several season before he joined Asante Kotoko FC. Liberty Professionals FC is struggling with goal-shy strikers at the time. Highly regarded Ebenezer Assifuah, who played for second level side Eleven Wise FC last season, has yet to score despite having played five matches. * Last week, Daniel Agyei (born 10.11.1989), the brilliant goalkeeper of Liberty Professionals FC, was included in the squad of the Ghana B national football team. * Otuo Acheampong is having a breakthrough season at Medeama SC. The talented centre-back was recently added in the squad of the Ghana B national football team after cementing his place in the heart of the Medeama-defence together with the consistent Godfred Rockson (born 20.10.1986). * Attacking midfielder Asiedu Attobrah and striker Adam Basit are still the main men at New Edubiase United FC. Last week, both players were picked for Ghana B. I wonder how long New Edubiase United FC is able to hold on to their starlets. * On 28.10.2012, I saw about 30 minutes of the match between Real Tamale United FC and Medeama SC. One player caught my eye; right-winger Abdul Aziz Yusif (born 10.11.1991). Yusif, formerly of AshantiGold SC, has scored three goals so far this season. Yusif can play in various attacking roles and is an energetic, pacy attacker who loves to dribble. From my point of view, Yusif, goalkeeper Collins Addo and left-back Michael Boakye, signed from AshantiGold SC, seemed like quality players. * Francis Narh of Tema Youth FC and the Ghana U-20 national football team has scored four goals in six matches. Last week, left-back Jeremiah Arkorful and midfield maestro Moses Odjer were picked for Ghana B. * Right-back Joshua Otoo and central midfielder Seidu Salifu (born 02.08.1990) were the only players of Wa All Stars FC in the Ghana B squad. * On 21.10.2012, Mustapha Mumuni made his debut for Wa All Stars FC. Mumuni is an interesting striker, signed from Asante Kotoko FC, known for pace and good strength.